If you're into family tree research, you'll know how easy it is to get totally sidetracked by all kinds of distant relatives who pop up in front of your face when you're looking for someone else altogether. It happened to me again yesterday, and I thought I'd blog about this little trip down a sidetrack, as it's a good example of thinking outside the square and finding answers in unlikely places. I'll try to keep this long story short, but please forgive me if I rattle on a bit. 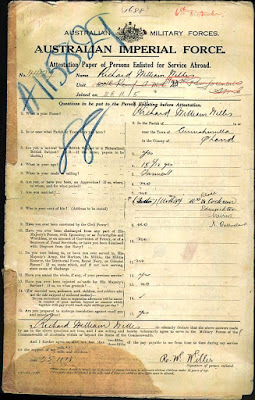 For some time I've had a woman called Rhoda Elizabeth Willis in the Australian branch of my tree as the wife of my great great uncle Alfred Cockrem, having got her name from the marriage record. I had no luck finding any further reliable information about her. But a short while ago I found her death record, which lists her father as Thomas Coles. Hmmmm... was he her stepfather, I wondered? Was she married before, to someone called Willis? Or have I got the wrong person altogether? I put those questions aside to deal with later. Then yesterday I was at the National Archives of Australia website, hoping to fill in a little blank about Alfred's brother, Frederick Cockrem. I didn't find what I was looking for, but I was able to fill in my blanks about Rhoda, just by acting on a whim - when I was about to click out of the NAA website, I suddenly decided to do a quick search for the name Willis in Queensland. One name that came up was Richard William Willis, apparently Rhoda's son. I found his WW1 service records - 42 pages of them - and on the first page, his 1915 enlistment paper, he named his next of kin as '(Mother) Mrs Rhoda Cockrem'. But wait, I also found a letter that Richard wrote to her, addressing her as 'Gran' and her husband Alfred Cockrem as 'Dad'! Whoa! What's going on here? So right away, I had more questions about Rhoda than I had before, and no answers. 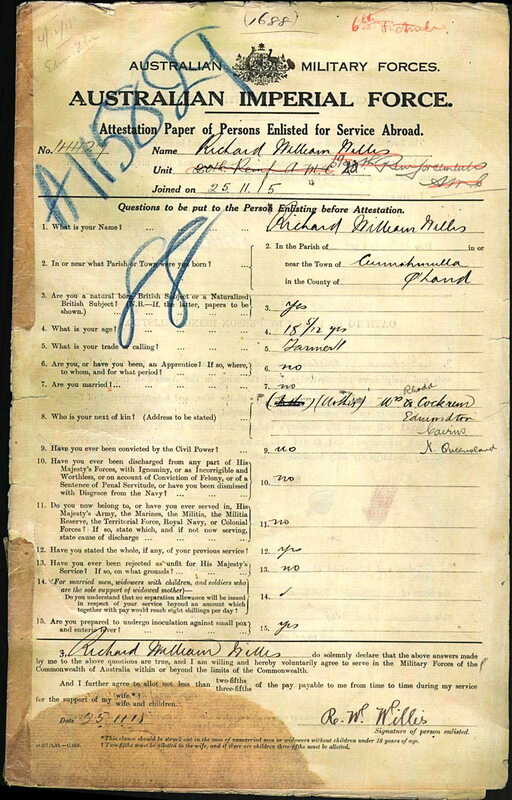 Richard's Attestation Paper, in which he said Rhoda Cockrem was his mother. A series of letters went back and forth on this subject, written by Rhoda, various branches of the Defence Department and Mr and Mrs Bert Kraft. (Not all of them are in the file, but are referred to.) 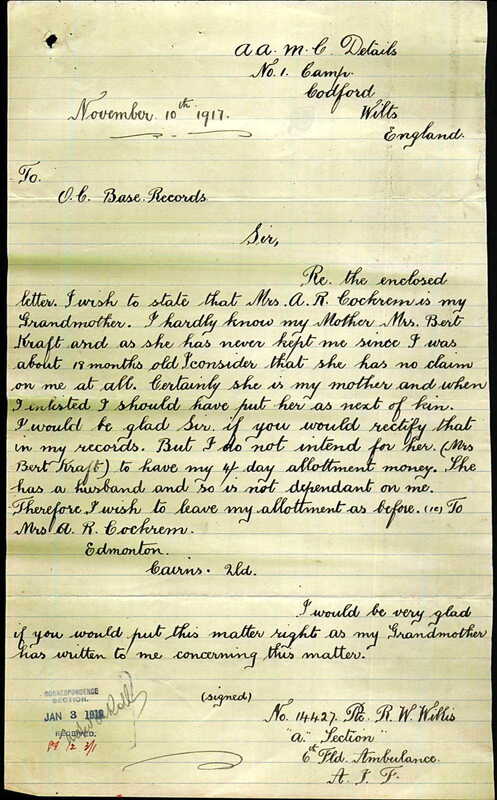 Eventually Richard wrote to the Records Office himself, explaining that Mrs Bert Kraft was his mother, but he had hardly seen her since he was about 18 months old, and she had no claim on him. And although he wanted to set the record straight about his next of kin, he didn't want his mother to get his 'allotment' of 4 shillings a day - he wanted his grandmother to continue getting it. 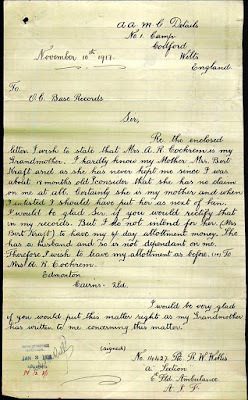 Richard's letter to the Records Office, 10th Nov 1917. So who was this Mrs Bert Kraft, I wondered? More delving soon revealed the answer. Another letter, from her husband, explained nearly everything - Rhoda had been married to a William Willis, and they had a daughter called Kathleen (now Mrs Bert Kraft). Richard was her son, born out of wedlock, and 'given up' when he was very young. The letter goes on to offer proof of Richard's parentage, via his birth certificate, and to ask if Richard's pay is being put into a bank, and if so, which one. Was Richard's money the only reason his mother suddenly got interested in him again? 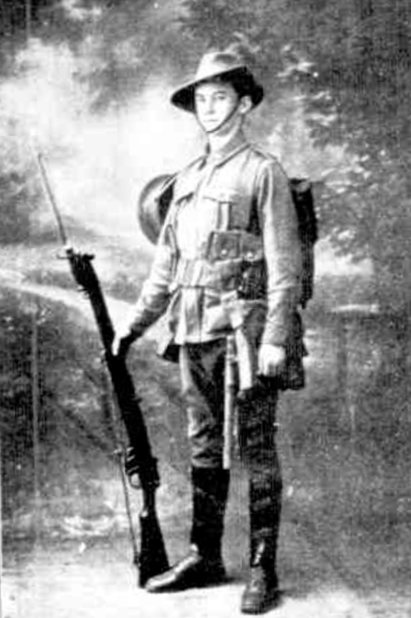 Richard Willis enlisted in the Australian Imperial Force in 1915 and served overseas until 1919 in 'A' Section, 6th Field Ambulance, spending much of that time in hospital with trench fever and frostbite. I didn't know any of that yesterday morning, and I still wouldn't if I hadn't looked beyond the first page of Richard Willis' service records, which I thought I had no reason to read at all. You just never know where that elusive information is hiding.